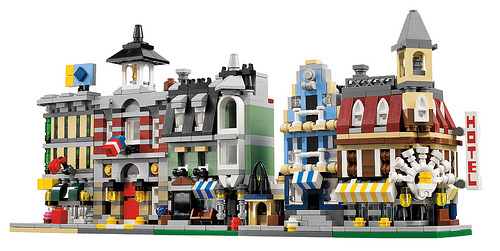 LEGO has just announced an intriguing new set that brings together nearly all of the modular building series, going all the way back to the classic 10182 Cafe Corner — 10230 Mini Modulars. The set is due out in January 2012, and will only be available to LEGO VIP Program members. The set comes with 1,356 pieces and will retail for $80 in the States. It includes Cafe Corner (of course), Market Street, Green Grocer, Fire Brigade , and Grand Emporium . I guess we’ll have to wait for the recently released Pet Shop until later (or build your own!). We’ve seen LEGO fans create mini/microscale versions of these sets for years (including Matthew Raehl’s mini modular street, mumu’s pre-release micro 10182, and many more), but it’s great to see an official LEGO take on this concept. See lots more photos in the photoset on Flickr. Watch this space for a video message from the LEGO designer who created this set. $80 for 1300 pcs, some of which may be “interesting”? I’ll pass. ^ Are you kidding? That’s an outstanding parts to price ratio.